Ladies, big game hunting in Africa isn’t just for the fellas anymore! You will simply love the pulse pounding thrill of shooting at exotic animals, but taking a trophy photo for Instagram that shows off the animal you killed while also showing off your killer curves can be difficult. Here are five slimming poses to try in your next photo of you and the elephant you just shot. Stand next to the elephant for scale. When it comes to taking a flattering photo with an elephant, use natural size differences to your advantage. 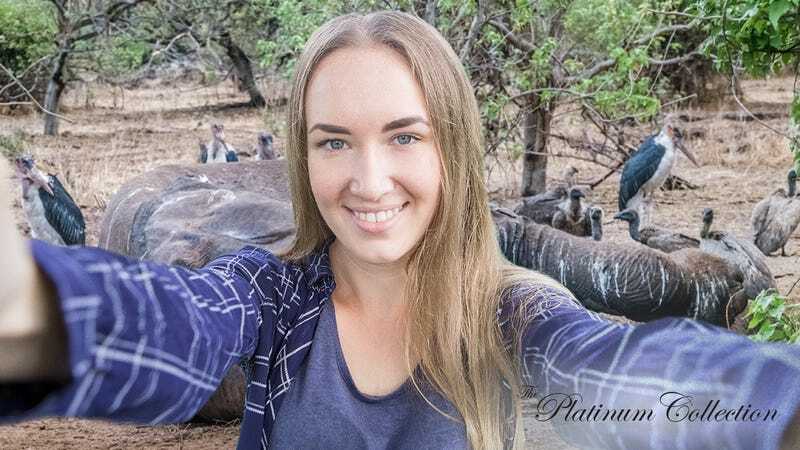 Striking a pose next to the limp, lifeless body of the massive elephant you just gunned down will make you look smaller by comparison, and your Instagram followers are certain to be too distracted by its big belly and massive thighs to even notice yours. Use the elephant’s trunk to accentuate your natural curves. You’re curvy, and you shouldn’t be afraid to hide it, especially on the open terrain of the savannah next to the endangered African bush elephant you just sank 26 bullets into. Show off that body and work those angles by posing the elephant’s trunk to accentuate your tiny waist or big booty. It’s 2018, and your Instagram followers know that when it comes to big game hunting, curves are definitely in style. Play with perspective by posing very far in front of the elephant with your arm raised to make it look like you are physically lifting the elephant up yourself. The peaceful elephant you just slaughtered in cold blood is a member of one of the heaviest land mammals in the world, so put its weight to work for you! Position the elephant’s carcass in the extreme background of the shot, and stand close to your camera with your hand out to make it look as if you’re holding up the elephant’s heavy body all by yourself. Anyone who sees the photo will know that you NEVER skip your power yoga class at Equinox, and the likes will come flooding in. Pose in the small sliver of space between the African elephant you shot and the Asian elephant you shot. This one’s going to require some light staging, but any Instagram pro will tell you that all the best photos do! If your big game hunting expedition is taking you through both Asia and Africa, be sure to haul the first elephant’s carcass along with you during your travels instead of just sending it straight home to be mounted. There is no place that will make your body look more petite than coyly peeking out between the tiny gap of space between the two limp frames of these massive mammals! Hide your problem areas behind a stack of lions. Every big game hunter has some part of their body they feel self-conscious about, but a couple of well-placed dead lions can easily block bulky areas from the camera’s view while still keeping the focus on you and the elephant you killed just for the sport of it. Whether it’s wide hips or unsightly calves, all you need to do is stack the lions to the appropriate height to hide those curves and let the rest of the photo speak for itself. It’s definitely going to be tough for your Instagram followers to avoid double-tapping on this one! Are you constantly trying to smell better than all of your rich friends? Using Old Spice’s new and exclusive scents “Captain” and “Ambassador” will surely set you apart from your wealthy associates. Click here to learn more.